Often called the sinking city, Venice is a wonderful place to spend a few weeks walking up and down little alleys. To truly enjoy the city, however, one needs to know how it came to be. Italy is one of the most interesting countries in all of Europe. The culture, language, climate and even the boot shape of the country are all things that draw people to Italy and its history. Within Italy, there are many cities that also attract people, including Rome and Venice. Venice, Italy is particularly engaging and deserves more than just a glance. Venice has a long and varied past. It was supposedly founded in 422 AD by Romans who were fleeing the Goths. The Goths, in turn, were trying to conquer areas of the Roman Empire. However, there are no concrete records of when exactly Venice was founded. Starting in the ninth century AD and continuing on into the twelfth century, Venice became a city state similar to other city states such as Genoa and Pisa. Strategically, Venice was strong, as it was situated at the edge of the Adriatic Sea and was virtually untouchable. It's naval and other marine forces made it a center of commerce for the region. Construction on the Venetian Arsenal started in 1104, and when Venice gained control of the Brenner pass in 1178, they also obtained all the rights to the silver trade from Germany. This made the city one of the economic powers of the time. By 1204, Venice had taken yet another turn. This is the period of the Fourth Crusade. Venice played a crucial role in the taking of Constantinople and creation of a Latin Empire. Venice's ability to send out ships to transport men and goods made them invaluable in the Crusades, and they received much plunder from the city's takeover. Venice's form of government also helped the city to prosper - here, a form of rule much like that of ancient Rome took place. A doge (or duke) ruled over the city state theoretically for life (although some of the doges were forced into early retirement). A senate, comprised of nobles, also ruled over the area as advisors to the doge. A mass of the citizens were included in the ruling class, but they held limited political power and were eventually removed from the government entirely. Modern-era rule of Venice started when the city state (republic) lost its independence after 1070 years of self-rule. Napoleon conquered Venice in 1797. By 1798, Venice was part of the Austrian Kingdom of Lombardy-Venetia. 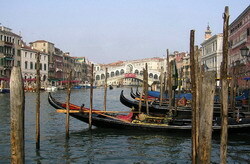 In 1866, Venice along with the rest of Venetia became part of Italy. Although initially dominated by the rule of the various Popes, the united country slowly developed into a full fledged republic.